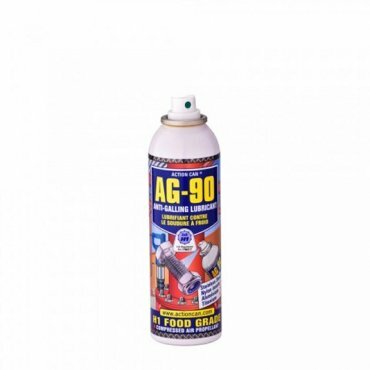 AG-90 is an extreme pressure rated anti galling and anti seizing lubricant. AG-90 is a specially formulated lubricant which prevents galling, seizing and subsequent snapping of stainless steel fasteners and fixings. This is sometimes referred to in the fastener industry as cold welding. AG-90 reduces friction and wear. AG-90 is optimised for stainless steel fasteners. AG-90 can also be used for titanium and aluminium fasteners. Pre apply AG-90 anti-seize lubricant before tightening to prevent threads seizing. AG-90 anti seize lubricant is recommended for all assembly work. AG-90 is particularly effective when used with powered nut runners. AG-90 is a H1 food grade food safe product .InS registration 1796317.